How much does it cost to travel to Mar del Plata? How much money will you need in Mar del Plata? 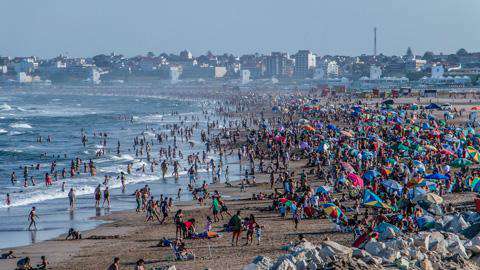 AR$1,945 ($47) is the average daily price for traveling in Mar del Plata. The average price of food for one day is AR$597 ($14). The average price of a hotel for a couple is AR$1,895 ($45). Additional pricing is in the table below. These average travel prices have been collected from other travelers to help you plan your own travel budget. How expensive is Mar del Plata? Mar del Plata is found only 404 km southeast of the city of Buenos Aires, on the Atlantic coast. Today Mar Del Plata is Argentinas most well known beach resort. It has successfully married the two worlds of beach and city into a fun, cosmopolitan urban center with the presence of highly developed tourist infrastructure. Founded in 1874, Mar del Plata was at first mainly an industrial and commercial center before becoming a vacation destination for Argentinians. For a peaceful trip and intimate oceanfront promenades, avoid visiting Mar del Plata during summer time, as the gorgeous arced coastline will be crawling with visitors. But the city is more than just beaches. It also offers some culture, lively nightlife, and great food. The popular Argentine beach destination and once a glamorous seaside resort is also known for its stunning architecture and cultural attractions. There are a few sights that you could visit as a family or during your romantic adventure in Mar del Plata. First, climb the water tower in Mar del Plata for the best views around the city. You will also find a free elevator to the top, which is powered by water, where you will get superb 360-degree views of the coast and the city. Another important sight in Mar del Plata is the Torreón del Monje, which looks like a castle with its lookout tower, red domes, and stone footbridge, though it has now been transformed into a restaurant and an event space. You will find this imposing medieval-style landmark, built during Mar del Plata's golden era by businessman Ernesto Tornquist in his attempts to beautify the town that surrounded his summer villa, along the rocks next to the ocean at Punta Piedras. Finally, Mar del Plata has a thriving fishing industry, so head down to the port to watch the red, orange, and yellow ships return with their daily catches. Step onto la Banquina de Pescadores, a charming wharf where you will have the chance to take scenic photos. Continue by strolling around the many souvenir stands and cheap, fresh seafood vendors where you can grab some great fried calamari. The Museo de Arte Contemporaneo is an icon within the city. The MAR is a relatively new museum in a modern and shiny building which faces the sea. It features contemporary artwork, including pop art, sculptures, and various pieces by famous Argentine artists in bright spaces and rotating exhibits. You can also head to the Juan Carlos Castagnino Municipal Art Museum, situated on Stella Maris hill, which holds over 450 artworks housed in French chateaux-style building that dates from 1909. However Mar Del Plata is mainly famous for its outdoor activities. This haven for sporty types has a long beach side where you can walk, run or rollerblade along, but also surf, sail and windsurf on the mad waters of the Atlantic. No matter what your taste in beach life, there is something for everyone in Mar del Plata. La Perla is set against the backdrop of the city skyline and has everything necessary to enjoy traditional day by the sea. Playa Varese is also a perfect spot for a relaxed beach vibe, where you can enjoy watersports and fishing. Head to Playa Grande for great day parties on the beach or in fabulous beach clubs. Further south you can find the dunes and forests for a real escape from the city and an hour away from Mar del Plata is the Playa Escondido or Hidden Beach for naturists. For family fun, check out the AquaSol water park a short drive north of the city. You can rent lockers, floats, and umbrellas, and there is a wave pool, a big variety of water slides, a zip-line and a restaurant. The entrance fee is affordable. If you've had enough beach time, the Aquarium is the perfect place to spend an afternoon. Only a few miles out of the city, discover this impressive city aquarium with its colorful tanks of fish, natural lagoons and saltwater lake and learn more about the local flora and fauna by familiarizing yourself with the marine mammals, birds, sharks, and even a few rescued animals that they rehabilitate here. There's a touch pool so you can get up close and personal with the sea life and shows which feature performances by dolphins and sea lions. This is one of the most modern aquariums in South America. Mar del Plata is an amazing beach city offering many attractions; one of them being excellent food! From the most exquisite seafood (especially the calamaries!) to a classic Argentine bife de chorizo, you won't be disappointed by Mar del Plata's delicious restaurants with fabulous views of the ocean beyond. There are numerous options for getting to Mar del Plata, which include by plane, bus, trains, and car. Most visitors planning a trip to Mar del Plata from outside of South America will choose to land at Buenos Aires Ezeiza Airport and then take a domestic flight to the Mar del Plata airport. Aerolineas Argentinas for example makes the 55 minute flight several times a day during high season. Otherwise, there are many rental car agencies in Buenos Aires, and driving to Mar del Plata will take from four to five hours. Another option is to take a train with the El Marplatense train company, which is also a five hours journey. The most popular transport used to get to Mar del Plata is the bus services, as they are faster than trains, cheap and incredibly clean.